LONDON–(BUSINESS WIRE)–Technavio analysts forecast the global digital English language learning market to grow at a CAGR of over 22% during the forecast period, according to their latest market research report. The increasing use of artificial intelligence and chatbots is one of the major trends being witnessed in the global digital English language learning market 2018-2022. Most digital English language learning solutions rely on artificial intelligence. The incorporation of artificial intelligence helps in developing customized English language learning solutions and tracking student progress. It helps in assimilating data from multiple sources and producing content that is customized for a student. Similarly, chatbots aid in facilitating conversation with a student via artificial intelligence and facilitates interactive learning. Used by 20% of the population, English is a widely spoken language. English is considered a common language of communication between countries and governments. The use of the English language is not limited to a few geographies alone, in fact, it is an official language in 39 countries and a co-official language in 34 countries across the globe. 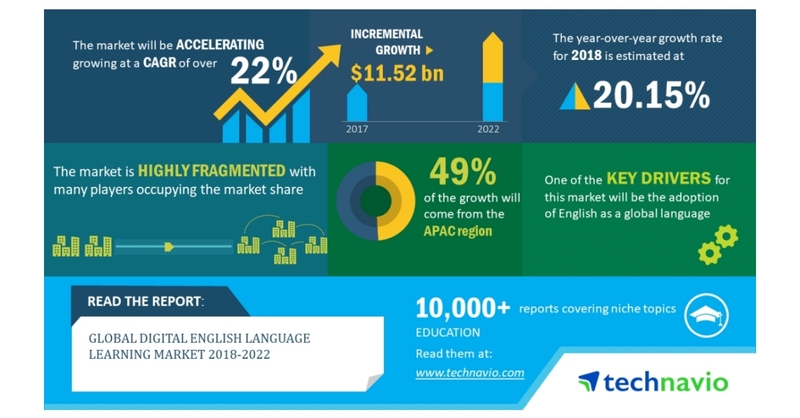 The global digital English language learning market research report provides market segmentation by end-user (non-academic learners and academic learners), by product (on-premise deployment and cloud-based deployment), and by region (the Americas, EMEA, and APAC). It provides an in-depth analysis of the prominent factors influencing the market, including drivers, opportunities, trends, and industry-specific challenges. Of the two major end-user segments, the non-academic learner's segment held the largest market share in 2017, contributing to over 55% of the market. The extensive use of English for corporate communication and the advent of smartphones and m-learning methods are the major drivers to impact the growth of the segment. The APAC region held the largest share of the market in 2017, accounting for more than 39% share. It was followed by EMEA and the Americas respectively. The market’s growth in the region is primarily contributed by India, China, and Japan. The incorporation of English and other foreign languages in pre-school grades is a key driver of the APAC market.